I’ve gone for a really casual outfit today, seeing as it’s Sunday. This feather print skirt from M&S Limited Collection is so easy to wear and I love the pocket details. It’s one of those no-brainer pieces which has a great fit and the pretty pattern keeps it interesting. I wore it with an oversize silk teal colour top to match the blue of the skirt and cinched it in with a brown belt. I’m adjusting to ‘tights weather’ with these lovely lace tights and giving my feet a rest with some classic suede loafers. If the the browns, blues and burgundys of the outfit tickle your fancy, please vote for me on the M&S Facebook page. Massive thanks to Susie from Take Out In Couture for taking these snaps. 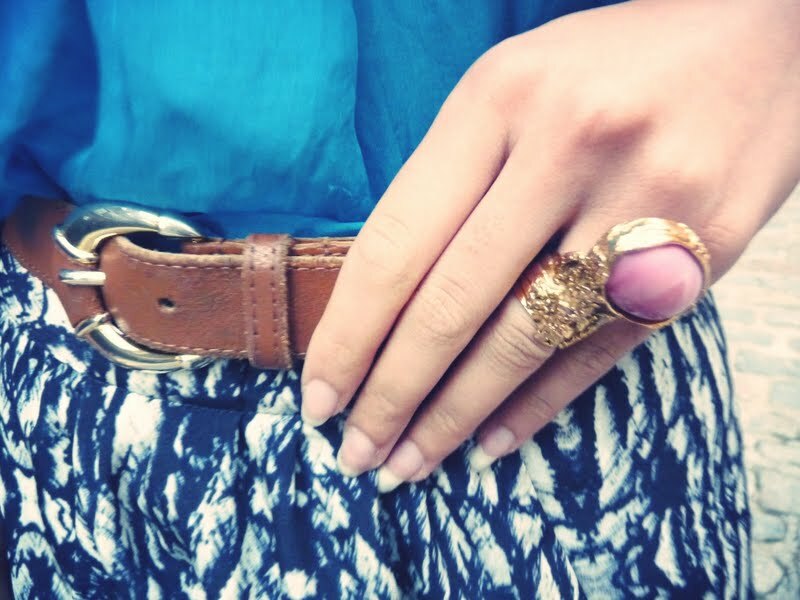 Pretty Reena, I want to steal all of your rings and bracelets! The skirt is so pretty! I love the print on it. You're doing a fab job on the challenge.